Ard Schenk, better known as the "Apollo of the ice", stamped his mark on the world of speed skating when he won three gold medals at the 1972 Winter Olympics at Sapporo, only missing out on a fourth triumph in the 500m after a fall. Such was the admiration of the Dutch, known for their fondness of all things horticultural, that a winter flower was named after him, the Crocus Chrysanthus Ard Schenk. He was also crowned world champion in three successive seasons between 1970-72, sweeping the board in a purple patch in 1972, winning all four disciplines, a feat which had not been achieved since 1912. He also has three European titles under his belt, finishing first overall in 1966, 1970 and 1972. Brought up in the small town of Anna Paulowna in rural northern Holland, Schenk was worshipped in his native country. He was named "Dutch athlete of the year" on three consecutive occasions, and he became so popular that a pop song written as a tribute to him climbed to the top of the Dutch hit parade. He set over 20 world records in his career and even had a variety of tulips named after him. 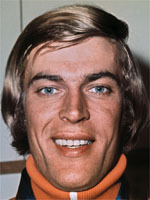 In 1972 he retired from competition, taking up a technical role with the American speed skating Federation. He worked as a television journalist at the 1974 Summer Olympics in Munich, and following his stint in the media, returned to Holland where he was appointed head coach of the country's Olympic speed skating team. Under his guidance, the Dutch returned from the Nagano games in 1998 with no less than 11 medals, five of them gold. After Nagano Schenk decided to call it a day and handed over the coaching reins to Leo Visser.